Link exchanges are very most popular and effective link building strategies that will improve your website’s rankings in the search engines, especially Google. But how do you exchange links in a way that will be the most effective and not trigger any penalties with search engines? When you receive a link exchange request or you contact some for exchanging relevant links, your best solution is to find a relevant page on your site and link from within the article to your partner’s website – with the anchor text that they requested. For example: I did a link exchange with AJ, the author of the popular 3 column SBI template which I also use on two of my sites. I link from my blogroll (see on the right) to his site with the anchor text SBI Template Design (And I just linked to his site again with the anchor text in the sentence above as an example of an in-content link! ), and he links to my sewing site (you’ll find the link in the examples section) with the anchor text “sewing machine reviews” (which is also on a content page). This is actually a 3-way link exchange since we don’t link reciprocally but I link to his site and he links to my other site. But this principle of in-content link exchanges works the same if you link reciprocally. When the webmaster agrees to in-content linking (try to persuade everyone to do that even when they suggest linking from links / resources pages! ), find a page on their site that possibly has some pagerank and is relevant to your topic. Find a keyword that is already on that page OR suggest that your partner adds a short paragraph which will include a keyword – the anchor text you’re looking for. 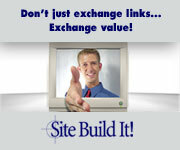 Are you interested in exchanging links? If so, please let me know where you’d most like me to place your link and also please give the URL of where you feel my link would fit best on your site. If we include each other’s keywords in our links, and near our links, we’ll get extra link relevance at the Search Engines. So please tell me what you would like your link to say, too. I’ll set it up right away. So this hopefully explains everything on how to link from within the content. Many webmasters prefer to create links pages where they list other sites as a resource for their visitors. Why would you create a links page? If you use in-content links, your visitors may leave your site when they read one of your articles and come across one of those links which takes them to another website. But if you use a links page, your visitors will read your articles, stay on your site longer and possibly buy something or click on an ad. Why not create a links page? Because your visitors will very rarely check your resources page and benefit from the links you recommend. Linking only from only one page to many sites is not natural in the World Wide WEB where pages and sites are interlinked with one another. And search engines know that. I’ve seen many examples lately where links pages have no pagerank although the site has good pagerank on most pages. This suggests that Google strips the pagerank from pages that have too many outgoing links and not enough content. The links pages still work though but I suggest you always add enough content (long enough description) so that the text / links ratio is very high. For example: I have created a page of tennis websites from which I link to many sites which reciprocally link back to me. The page still has a pagerank of 3 and provides a good value link to other sites. Description: A Singapore Tennis Blog & meet up group for Regentville Condo based players. Find tennis racquet reviews, tennis tips and general reviews here. So what the webmaster is asking me is to use the Title as the anchor text when linking to his site. You can check my tennis links page again to see that I did link to my friend’s Nawin’s tennis blog. If I cannot convince the webmaster to use in-content linking and they have a links page with some pagerank and less that 30 (or maximum 50) outgoing links, then I can request the link in the same way as they requested a link from me. Choose a keyword you want to rank high for as your Title, choose a page (internal page or your homepage) and add a short description which will explain to a visitor what your page is about and will possibly include some of the related keywords to your main topic. If you have any more questions on how to exchange links or you’d like to share what worked for you, please comment away!